It is 1975. You are president of the United States. 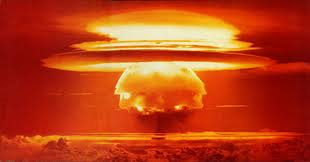 There has been a thaw in relations with the USSR (Nixon) but both side still have about 12,000 nuclear warheads each. Most of these can reach their targets via submarine, bomber, or ICBM within 60-90 minutes. If all of the weapons were launched based on a crisis or, worse, a misperceived attack by one side, the explosive power released would be 1 million times that of the a-bombs dropped on Japan. Now, think carefully. All of your intelligence services confirm that for some in credible reason, about 1,000 Soviet missiles have been launched and headed for the US. This would average about 20 H-bombs per state, more than enough to end 99.999% of all life in the US. Cities and towns would be burned to a crisp (yes, Alaska, too). The rural areas would received a toxic soup of radiation that would finish off even people in remote areas within a few weeks. As Khrushchev once said, “the survivors would envy the dead”. Again, You hold the power to act in this very short time. Your country is finished– almost certainly, within 2 hours. Done deal. What do you do? The answer may not be as easy as it looks, and there may be more than one answer, but probably only one GOOD answer. No penalty for whatever answer you choose. Reward for thought-ful answers. Drat, the date is 8 years before I could go with Plan A: http://learning.blogs.nytimes.com/2012/03/23/march-23-1983-reagan-proposes-star-wars-missile-defense-system/ . Particle beams aside…This scenario comes down to “Well, we’re dead so how many people do we take with us?” My first thought would be fire more nukes at the incoming nukes! However that’d kill a lot of people very quickly. You’d figure the nuclear warheads would meet over the ocean. Well, mission accomplished, sure a lot of dead fish and a lot more unusable water, however we live, right? Nope, first the contaminated water would spread. Also, there were a set of tests called HANE (High-Altitude Nuclear Explosion). The USSR and America wanted to see what would happen if nuclear missiles were used at high altitudes. Turns out it results in a much bigger and quicker spreading explosion and the radiation spreads faster and travels much greater distances. I bring this up because this means we’re all dead anyway if I go with this option. The warheads would meet and explode in the air and then kill us and most likely anyway. Plan two, Launch our nuclear weapons and take Russia out. This means countries next to them would also be effected, so goodbye China, Ukraine, and Poland. Plan three, flee the country and leave my citizens unaware of the threat until they all die. Let’s just scrap this idea right now. Plan four, attempt to open diplomatic channels with the USSR and hope they disarm the warheads and let us live. I think I’d go with plan five. Launch 10,758 nuclear warheads at Russia. Then divide the remaining 1,242 warheads and launch three at each countries capital, two in their most populated area, and lastly ten into the moon because at this point, why not? I’d leave Canada alone, this is simply because this is my hypothetical and I like moose. Now every country (besides the moose-rich Canada) has two hours to talk to each other and come about a peaceful solution that doesn’t mean the end of earth. I’d call this my bigger stick policy. Where I run loudly and carry a large nuclear stockpile and all of my warheads have a single stick painted on them. This would mean either everyone disarms their nuclear stockpiles or we all die (except the moose). While this goes on I would inform my citizens. This would cause one of two results. First, they all do as we, the government have taught them and run to the nearest school and hide under their desks and we all know desks stop nuclear warheads. Second, mass looting and panic. At least I can say I’m honest and up front with the people of my country. Really droll and provocative, Andrew and I won’t show all my cards at once. I may need to read through this again but I want to stress: 1. It is not what the president does With Himself that is the point (think Henry Fonda, FAILSAFE) but what he does as president on behalf of the country and the World/Mankind., 2. Help me understand the benefit of the pinpoint targeting of the USSR to take out an additional 200 million or so lives, or, more likely, ensure that 90% of the World’s population will die fast or worse slow deaths. Just checkin’. Good work. p.s. absent a technology you don’t mention, there is close to zero chance that any warheads would meet and explode in the air. Just as when the Andromeda and Milky Way galaxies collide in 4 billion years, the is almost no chance that any 2 stars will collide (law of large numbers/distances). scrap # 4 because they no can disarm missiles in the air in 1975 (reliably, if Ever), much less open up diplo- channels.